When Lasallians pushed for cleaner water systems, DLSU said yes—and gave them milk tea. A recent project by the administration has revealed that the University’s water fountains have a higher concentration of Echosera coli (E. coli) than the infamously murky waters of Manila Bay. Shocked and disturbed by this discovery, the school administration, as well as the De La Salle University-Parents of University Student Organization (DLSU-PUSO), decided to take drastic steps to ensure their students’ well-being. After intensive research and testing, the administration has decided to replace the campus water fountains with milk tea fountains. In a unanimous decision by top officials, milk tea was found to be the most desirable drink for the students. Iced coffee and alcohol were also included in the roster of choices. In this article, The LaSallian sheds light on the recent development and uncovers the feeling of Lasallians and milk tea establishments around the area. Buzzing with excitement, glass containers in hand, a certain class traveled to Manila Bay to gather samples for a special experiment. Walley Toobeeg, head of the Water Testing Facility and seasoned water drinker, shared where the idea for the project started, “Since the Manila Bay clean up was all over the news, we decided to do an experiment to test just how clean the water is now.” He shared how, at first, he was a bit apprehensive of the experiment, expressing disbelief at the idea of Manila Bay being cleaner than the school drinking fountains as the University has a water filtration system set in place for the fountains and has tests conducted routinely to make sure the water is clean and safe for drinking. You can imagine the administrators’ shock when the results of their experiment came back. Toobeg explained, “We’re not allowed to reveal the exact results of the experiment, but let’s just say that range of the Manila Bay sample was significantly lower than that of the DLSU water fountains.” To give an idea of the acceptable levels of E. coli, treated drinking water must have zero presence of the disease-causing bacteria. Set to completely replace the old fountains by the third term of this academic year, the milk tea fountains will be the first in the country, another landmark for the University’s list of achievements. Infinitea, the lone milk tea shop within the campus located in Br. Bloemen Hall has already closed a deal with the administration. Contents of the deal have not been disclosed as of press time, but it is expected that they will be distributing the milk tea and sinkers throughout the campus. However, it is unclear if they will still resume their food stall operations inside the school. Just like how the fountain water was filtered and reused, the milk tea fountain will also feature a state-of-the-art filtration system that will draw out any impurities from the liquid. To ensure the health and safety of the students, the drink will also be infused with vitamins and minerals that can significantly boost students’ motivation and mood. Since making the decision, the administration has received heaps of praise from the student body. It has also gained favorable responses from faculty members, who will reportedly be given special milk tea add-ons cart next to the fountains in the Faculty Center. Supported by the Facilities Management office, the new milk tea fountains were tested last March 29 to get initial reactions from the students. Dina Susubo Jr. (I, MEEMTE), one of the testers of the prototype, says that he was thrilled with the addition of the pearl shooter apparatus, a machine dispensing tapioca pearls that is attached to the fountains. He said that he particularly likes to have the balls shoot at him, his favorite part being able to choose what syrup he would like for the day—despite it making a mess of his white polo shirt— as he savors the sweet taste of pearls going down his throat. 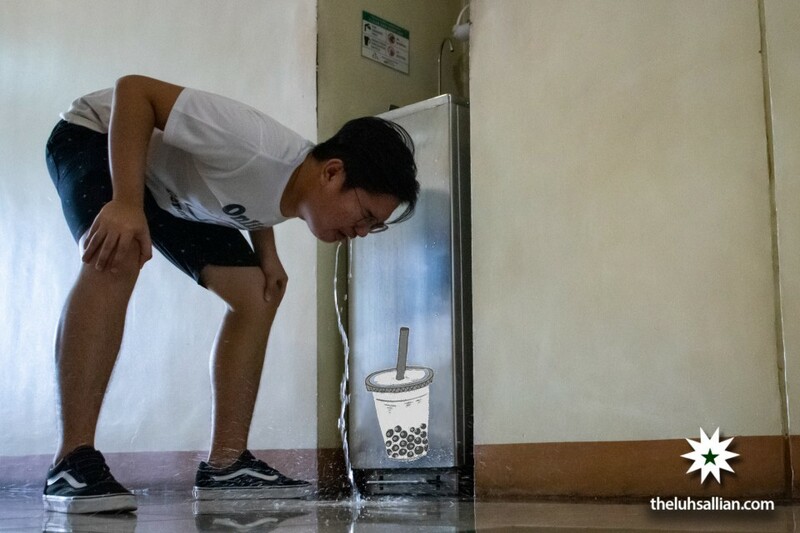 While the school’s transition to milk tea fountains is revolutionary and generally well-received, there’s still more the administration can do to improve on their decision. Several students have raised concerns about the milk tea fountains ostracizing a part of the student body, citing reasons such as lactose intolerance and general taste preference. In light of the previously mentioned concerns, the school administration, in cooperation with the University Student Government, will be conducting a University-wide survey to fine-tune the new fountains. The survey will cover everything from preferred drink flavors, milk types, and sugar levels adjusted for medical or dietary needs. While still in the works, Lasallians can keep an eye out for fruit tea fountains and coffee fountains in the near future. In the meantime, students can indulge themselves to their hearts’ desire in milk tea and pearls.